The biggest surprise is the strong support for Labor in the Murdoch press — a marked difference from 2004. 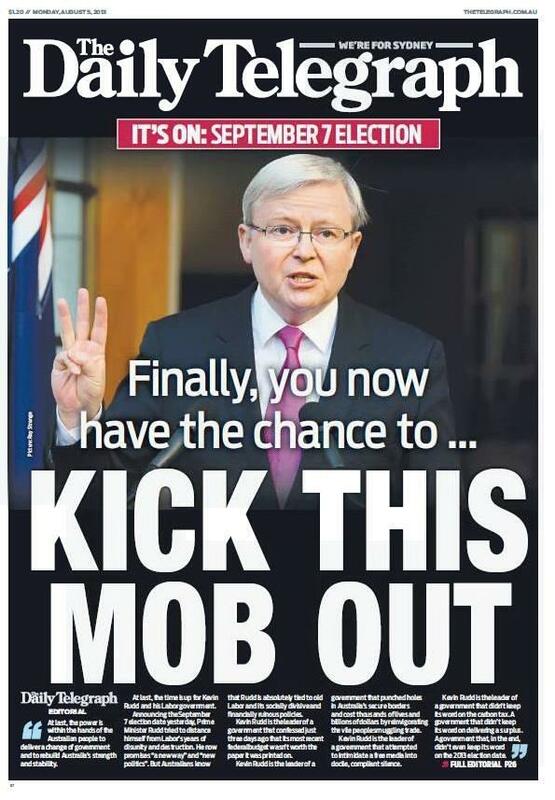 The Australian, Daily Telegraph, Courier-Mail and The Mercury are all throwing their support behind Kevin Rudd. À la folie … pas du tout. Grow up. Take it like a man Kev. He has a prominent bottom lip. When Tony Abbott became leader of the Coalition, he had two private meetings with Ruppert Murdoch. I think all the parties including the Greens are controlled by our international central bankers. Abbott will bring on austerity with the noble cause of reducing the debt but he will never instigate a people’s bank like the Commonwealth used to be. Our leaders all take their orders from the private Bank of International Settlements via APRA and I see no change from this cognitive dissonance stupidity. As George Carlin said you have owners – they own you, they own the politicians……..
1. Local Governments in Australia are corporations, eg: the Coffs Harbour City Council is a corporation registered on the Australian Business Registry with the number of 79 126 214 487. 3. Federal Government in Australia is a corporation, ie: the Commonwealth of Australia is a corporation registered in the U.S. Securities Exchange Commission with the number of CIK (0000805157) SIC: 8880. CIK is the Credit Suisse Asset Management Income Fund, Inc. (the Fund) – is a diversified, closed-end investment company. The Commonwealth of Australia is a “debt security”, packaged up as a “corporation”. The Commonwealth of Australia is a chapter 11 bankrupt. and STATE OF QUEENSLAND inc.
Tony/Malcolm will have the perfect “In” to slash and burn as he/they will no doubt discover that Labor has been cooking the books and things are much worse than we were led to believe. So, Taxes UP, pensions down, Austerity UP. Welcome to Greece! Anyone noticed that Youth Unemployment is running at 27%. Not good!! We are the Present Day Serfs and need to focus on getting back our once great Commonwealth Bank.40 % of their shareholders are made up of HSBC,JP Morgan and Goldman Sachs. A few elites own and control this Western cesspool of corruption. Their greed is taking us all down. No a fan of newspapers so obviously backing one party over another. Decision should be made by the people not by the papers.